Many of the retail stores and restaurants in Downtown Bend participate in Art Walk and have a beautiful selection of art in their establishments. 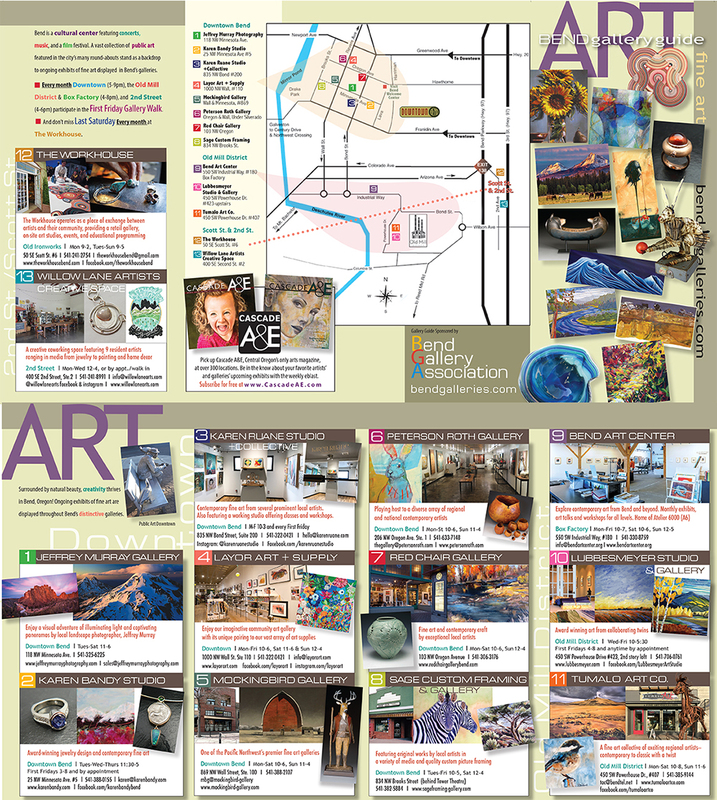 However, you'll want to be sure you don't miss any of our art galleries during your participation in art walk because each one is unique and charming. Here is the list of must-see art hubs in Downtown Bend. You can also download a Gallery Guide here. Located in the heart of beautiful Downtown Bend, Oregon, Mockingbird Gallery is one of the Pacific Northwest's premier Fine Art Galleries. Mockingbird Gallery features original paintings & bronze sculpture by regionally and nationally established artists. Sophisticated work and showings in an intimate and comfortable space. ​Located in the Old Town Historic District in Bend, Oregon, on the corner of Oregon Avenue and Bond Street in the O'Kane Building. Red Chair Gallery is one of the finest in art and contemporary craft. ​At Liberty Arts Collaborative encourages the exploration of arts and culture without restraint. Located in the historic Liberty Theater, At Liberty hosts rotating contemporary art exhibitions, serves as a unique event venue, and is home to some of Bend's most creative nonprofits. The Karen Bandy Studio has been in Downtown Bend for over 30 years. Experience a visual adventure of exquisite moments in nature captured by world-renowned photographer, Jeffrey Murray. Visit our gallery in downtown Bend, Oregon to view our newest works taken of landscapes near and far. Layor is a creative environment where quality art supplies are accessible and the local community is inspired to #liveart. I'm a multi-disciplinary artist, focusing in fluid mediums. My studio + collective is based in Bend, OR. We feature the artwork of 6 local artists. I welcome licensing opportunities and commissions! Exquisite framing from master craftsman and owner Denise Rich. Both art and heirlooms receive personal care and attention. Excellent service, thought to detail and value make Sage Framing the choice for local artists. Reliably in the same location for over 16 years, Sage Custom Framing and Gallery is conveniently located in historic downtown Bend on Brooks Street between the breezeway and the Tower Theatre, adjacent to Mirror Pond parking lot.